This YouTube video explains Cloud Computing Applications in a fun and unique way. It is approximately 3 minutes long, take the time to watch as you will learn some fun facts! Enjoy! Cloud based Apps are programs that can be accessed via the internet. They are available to users 24/7 for their personal convenience. 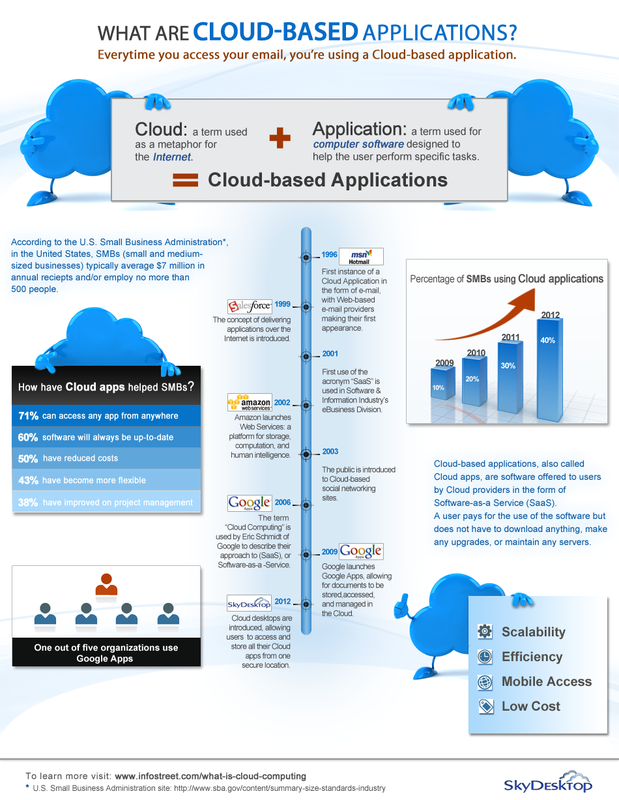 There are a variety of types of Cloud Based Apps depending on your need. There are several servers/apps available for you to see what type of service you are interested in click here. Essentially, cloud computer connects to a remote server to store your data and information which enables the user to access their accounts from anywhere. Who can use Cloud Based Apps? Anyone can use these applications as long as they have a server to log into. Most apps require minimal IT knowledge and seek to meet a variety of needs for individuals or businesses. As the user, you can purchase more storage or customize the package based on your personal needs. There are plenty of applications out there, you are guaranteed to find one that suits your needs, be it personal or professional. To learn more about the pros and cons of Cloud Based Apps, please click here. What are the common applications available to me? We have listed some of the more common applications on our webpage. To learn more check our common apps section.